The Kansas City Coalition for Life has begun another 40 Days for Life prayer vigil in front of the Center for Women’s Health abortion mill at 4840 College Blvd. in Overland Park. This is the same abortion facility we pray in front of on 2nd Fridays of each month. 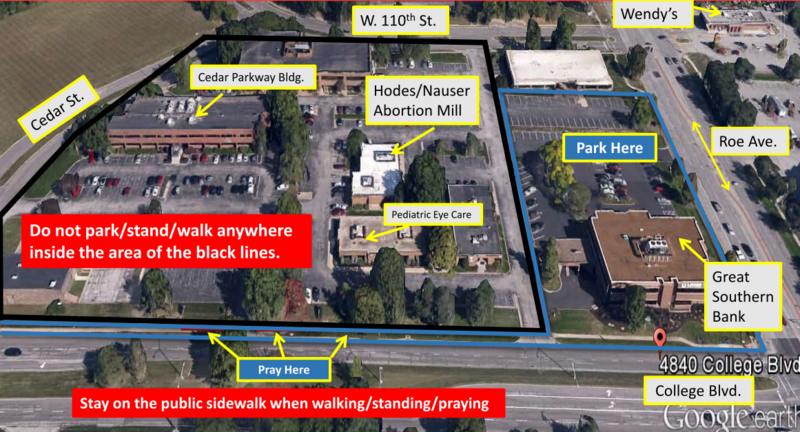 The 40 Days for Life campaign is designed to be a peaceful, prayerful witness for life asking God to intervene on behalf of the unborn and especially for the grace of closing this abortion facility in Overland Park. Volunteer prayer warriors are asked simply to stand and to pray in front of this abortion mill anytime during the hours between 7:00am – 5:00pm from Sep. 26th through Nov. 1st. St. Philippine Duchesne has been asked to provide coverage for one full day of prayer during the 40 Days. We have agreed to provide prayer volunteers on the last day of the campaign, Sunday Nov. 1st A sign up sheet will be placed in the church for volunteers to sign up for one hour (or more) on this day.